For some, however, maybe that’s not a problem. These words represent noble aspirations. Maybe it doesn’t matter if what they mean is a bit blurry. However, if you wanted to be skeptical, this ambiguity often means that every man and his dog can use the buzzword to justify anything they are doing (and usually just keep on at business as usual). I mean, what is a sustainable housing development or a sustainable industry or even a sustainable landscape? Yes, I know there are whole text books exploring what these things could be, but in practice what does it mean? As far as I can see, a sustainable housing development either uses a bit less water (or energy) or leaves a few more trees around. A sustainable industry is one that continues to prosper and grow through a whole political cycle. And a sustainable landscape is anything you want to make it (and the answers are quite different if you’re a farmer or a conservationist). It’s easy to be cynical about buzzwords. At the same time, it must be hard for the proponents of the concepts encapsulated in those buzzwords to see their hopes being superficially treated or, worse, cynically exploited for short-term political gain. Proponents of sustainability, for example, appreciate it has contained in it concepts of intergenerational equity and limits to growth. As a buzzword, however, it often simply means business as usual but carried out more efficiently. In this last year I have felt the keen sting of an important concept turned into a buzzword. The concept is ‘resilience’ and many people are labelling it (discounting it?) as the new ‘sustainability’. In 2006 I co-authored a book called Resilience Thinking, a text that attempted to present resilience science in an engaging and accessible manner. It promoted resilience as an important concept worthy of becoming a policy goal and a central plank of natural resource management. Ecological resilience is really about understanding the complexity of the systems we depend on (catchments, agricultural industries, forests and fisheries etc) and what allows them to continue to provide us with the goods and services we rely upon for our survival. Ecological resilience is: “the capacity of a system to absorb disturbance and re-organise so as to retain essentially the same function, structure and feedbacks – to have the same identity.” In other words, resilience is the ability to cope with shocks and keep functioning in much the same kind of way. A key word here is ‘identity’. It imparts the idea that a person, a society, an ecosystem or a social-ecological system can all exhibit quite a lot of variation, be subjected to disturbance and cope, without changing their ‘identity’ – without becoming something else. Resilience thinking is based on appreciating the complexity of the systems being considered. Its building blocks are the concepts of thresholds, interconnected domains, cycles and scales. 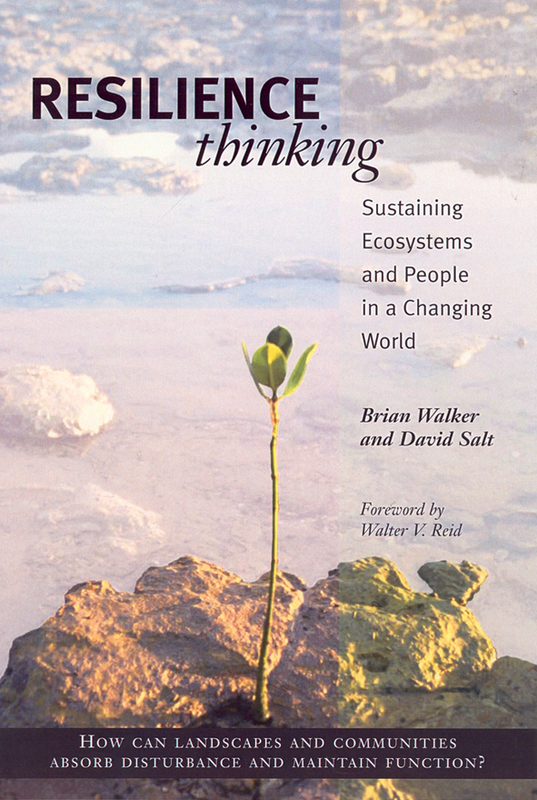 Read the book if you want to know more or visit the website of the Resilience Alliance, the organisation that has developed much of the science contained in resilience thinking. We ‘sold’ resilience as an important concept and look what happened. It’s now in every vision and mission statement, especially those to do with environmental management. These statements always include something like: “We – insert government or company name here – are investing in a healthy and more resilient environment.” You see it everywhere though figuring out what is meant by resilient is far from clear. Resilience has become a buzzword. Of course, the book Resilience Thinking was only a very tiny part of a large push by many scientists and organisations to raise the importance of resilience science. However, it did play a role. More importantly for me, I was personally involved. While it’s great to see resilience being held up as a policy goal, I feel the sting when I hear people discount it as just another buzzword for our leaders to hide behind. Unfortunately, there’s some truth in this assessment. Our leaders invoke ideas of resilience without any commitment to engaging with what it means. The idea of ‘being resilient’ is increasingly desirable as climate change and resource degradation make the world increasingly uncertain. Maybe that’s why our political leaders have been quick to use it. However, unless we move past the buzz and engage with what it’s really about, then its value may be quite limited. David is a science writer based at the Australian National University in Canberra. He is the editor of Decision Point.